This stylish Mother’s Day design is eye catching and a wonderful choice to tell your Mum you love them. This gorgeous luxury Mothers day card is a wonderful choice for you to send your love to your Mum on Mother’s Day. 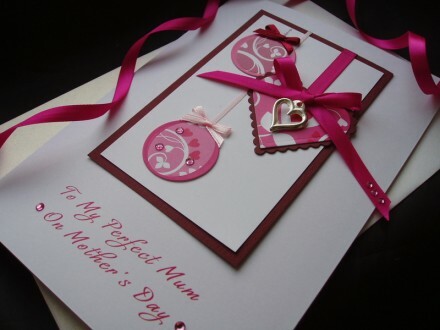 An elegant design featuring a raised pane that is decorated with heart and round shaped baubles adorned with pink rhinestones, pink satin ribbons and bows… A truly stunning luxury personalised mothers day card is a gift in itself.